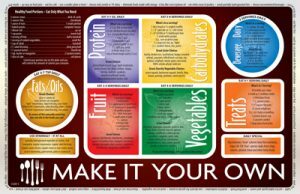 Whether you are a ‘mom-on-a-mission’ to feed your family healthier, a young adult who would like to lose some weight or an average ‘middle-age’ guy who would like to come off some of his medications, this creative teaching placemat is a proven effective tool to remind us (at most meals) to eat a more thought-out, colorful, and well balanced diet. The ‘My Nutrition Placemat’ is specific for any adult age 19 and older. The serving sizes reflect a calorie range of 1800-2200 calories daily. When you control your portion size on the plate, you control the amount of calories you consume. 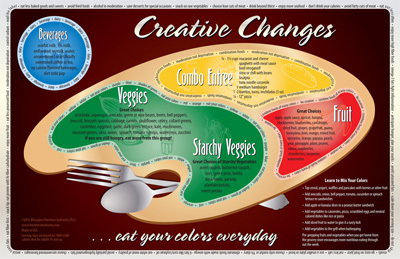 The front side of the placemat is titled, ‘Creative Changes’. An artist pallet exemplifies how creative we can be in striving to eat a healthier and more nutritiously varied diet. We are crammed with the busyness of life! Do you think it is ‘healthy’ to eat macaroni and cheese at dinner? It definitely is not a smart dinner choice when we choose to fill our plate with just the macaroni and cheese (or meat lasagna) and a little canned corn, then call it a good meal. However, macaroni and cheese can be a good choice when we choose to eat it like our ‘My Nutrition Placemat’ says we should eat it. ‘My Nutrition Placemat’ does not tell you to avoid macaroni and cheese or meat lasagna, but it does remind you to be mindful of the actual portion size you should eat. Even more importantly, your placemat will remind you to eat a small salad, a steamed veggie and a fruit WITH your meat lasagna! ‘My Nutrition Plate’ is like having a nutritionist sitting with you, at every meal. This helpful tool promotes a positive process of change towards more balanced eating in your life, not only on your plate, but also in your mind. The outer white rim on both sides of the placemat is lined with ‘easy-to-remember’ nutrition tips. If you look at your placemat and read it each time you eat, it will ‘talk’ to you. These sayings will help you stay focused on feeding your body a better way. Your reward for listening will be weight loss, more energy and better health.